The book answers the question: Should a reasonable person believe in God? Within the pages of J. Steve Biggs’ new book, Beyond a Reasonable Doubt ($22.99, paperback, 9781545656082; $9.99, ebook, 9781545662113), readers will find a book that compares, side by side, the latest scientific observations against the ancient words of the Holy Scriptures and allows the reader to decide if a reasonable person should believe in God. Beyond a Reasonable Doubt should appeal to anyone who questions or rejects the notion of a supernatural God on the basis of real errors in the Holy Scriptures concerning the creation of the universe, the origin of life, the appearance of mankind. J. Steve Biggs is a retired chemical engineer and management consultant. He is a Distinguished Engineering Fellow of the College of Engineering and Outstanding Fellow of the Department of Chemical Engineering at the University of Alabama. He also attended Harvard Graduate School of Business. Xulon Press, a division of Salem Media Group, is the world’s largest Christian self-publisher, with more than 12,000 titles published to date. 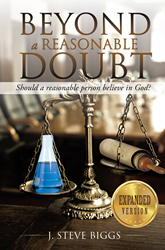 Beyond a Reasonable Doubt is available online through xulonpress.com/bookstore, amazon.com, and barnesandnoble.com.